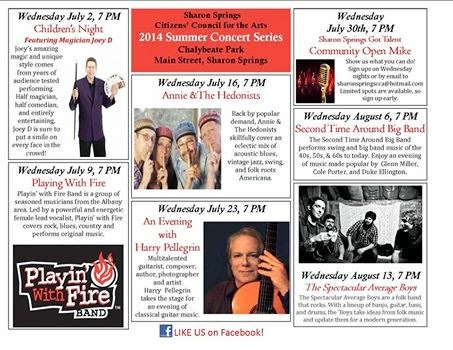 The Sharon Springs Citizens' Council for the Arts will be hosting its inaugural concert of the 2014 Summer Concert Series this coming Wednesday, July 2nd at 7:00 p.m. in the first of seven such musical treats at Chalybeate Park located on Main Street in the bustling community. Performances will change with each week, and will include a myriad of uniquely themed events such as Children's Night with magician Joey D and a Community Open Mike night, while featuring traditional artists and area bands the remainder of the time. The series concludes on August 13th.